Recording your music, or other vocals, can be a very rewarding experience for most people. It's fun to do, and it's great way to show off your talent to family and friends. People love to listen to music, and are sure to pop in and ear phone and head your way. But what if there is a terrible hissing noise in your recording? One that distracts you, and the listener from actually hearing your music. Worse, what if it makes the listener want to shut the music off? This noise is what is referred to as sibilance, and with a few easy steps, it can be avoided. Simply put, sibilance is a hissing sound. Sibilance is actually a part of the phonetics of language. It's an acoustic characteristic of certain consonants and is created by the tongue directing a stream of air to the teeth. It's the hissing sound created when a person says words like this, sip, or chip. Or remember the saying "Sally sells seashells by the seashore?" That hissing is a perfect example of sibilance. When speaking, the roof of your mouth projects sounds for the ear to hear. Sibilance is created when that sound is exaggerated. Space between a persons' front teeth, the shape of the tongue or palate, and sometimes a certain way of speaking can create this exaggeration and produce a pronounced sibilant delivery of a consonant. The sibilant sounds are created by the "s", "t", "z" and sometimes the "c". These consonants are at centered at 5kHz to 8kHz, although the problem can occur at higher frequencies as well. Sibilance is a very necessary part of our speech patterns, but at times, the over-pronounced consonants can create an irritation on a persons' ear - for example, when speaking, or singing into a microphone. Through the microphone, this can create a very harsh, distracting sound. What effect does sibilance have on audio? This distinct sound is often very pronounced in audio recordings. If these sounds are not taken care of before the release of an album, it can make the recordings very difficult, often painful to listen to. Not the effect the musician is hoping for when sharing their music. There are some ways to tame this sound, and reduce it from your mixes, so there is hope for those that have pronounced sibilance in the microphone. The easiest fix for this issue is to have the vocalist sing without creating any sibilance, but that is not a realistic expectation for any singer. There are; however, a few things the singer can do to minimize the sibilance from a recording. If your vocalist has a bright top end, look for a darker microphone. Look for a microphone that has a vintage sound condenser, or a microphone with a softer dynamic. The goal is to find a mic that has a smooth top end. 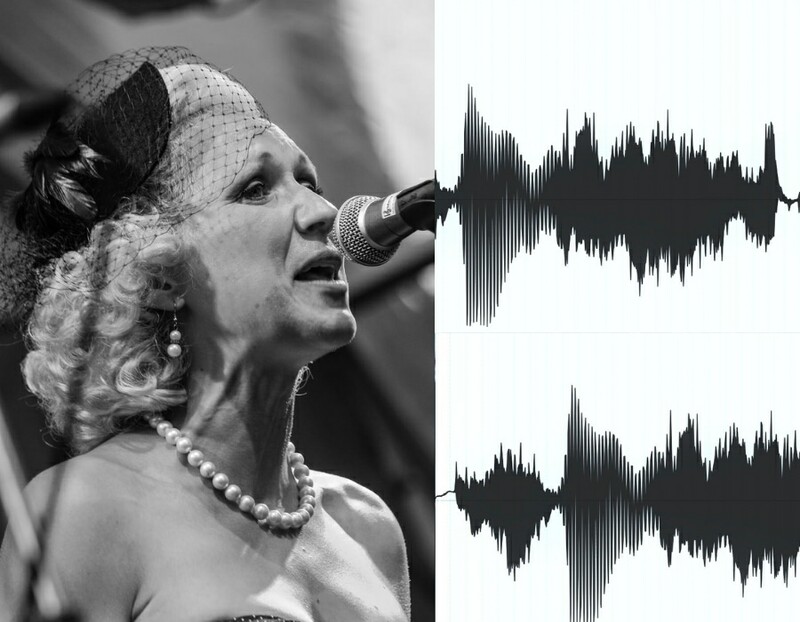 There is no scientific approach to finding "the right mic" as each vocalist is different. Just play around with microphones until you find one that works well with the vocalist. This sounds overly simple, but holding the microphone in the right spot, at the right angle, makes a huge difference in the vocals being picked up by the mic. Angling the microphone to side of the mouth will change the frequencies being gathered, as will holding it at a 45 degree angle. Keeping the microphone two fists away from the mouth can also help. Try eliminating the use of the upper palate by placing a piece of gum there. Have the vocalist chew up a piece of gum and stick it to the roof of their mouth. This can dull the hissing sound. This trick comes from Eyal Levi and has been shown to work rather well. Grab a wooden pencil and rubber band. Use the rubber band to attach the pencil to the microphone, at the grill, going straight up and down. You'll have to experiment with this a bit to get the best results for your vocalist. As an added plus, this trick also works to minimize plosives (the hard p and b sounds you get in the mic). Some or all of the techniques may work for you. Experiment and mix and match to get the best results. Each vocalist will have a different sound, and different tricks that work, so don't discount something if it didn't work the first time. If you can't get rid of the sibilance through the source, there are some other techniques to try when mixing the music. Now that the vocalist has done everything they can to minimize the sibilance being recorded, it's up to the mixer to finish getting rid of it in the track. There are two issues we need to consider when listening to the recording. The first issue is the human ear - the way we hear makes our ears sensitive to higher tones, even when they are at a low volume. This means that even though the "s"s and other sounds are lower than other sounds, they still stand out. The second issue is with the speed of the sibilant sounds - they are fast, very fast. So, how exactly do we erase these sounds then from a recording? Listen to the recording while riding the fader. Every time you hear a sibilant sound, turn the fader down. This is an easy, simplistic approach that everyone can use, but it gets to be very time-consuming when you have a lot of music to process. This is exactly what it sounds like. De-essing is a process that get's rid of the "s"s. It uses a classic compressor to process out the sibilance. There are quite a few different techniques to try, and several ways to go about de-essing, so we'll tackle them one by one. Two of the more popular and simpler techniques are Frequency Selective and Wideband de-essing. When this technique get triggered by silibance, it turns down the treble range in your vocals. It does leave the leading edge of the "s" in place and make your vocals sound a bit pitchy. Some other words get caught by the compressor and at times this can pull down the overall sound of the vocals, leaving them a bit dull. This approach only reacts to the frequency range and also leaves the leading edge of your word unchanged, and like the frequency selective, your vocals can become dull when the compressor grabs extra words in the frequency range. Both of these methods; however, are much faster than riding the fader. A more advanced technique with cool results, this is fantastic for digital mixing. It’s a bit difficult to set up when analog mixing, but can be done. To trigger the de-esser, you first copy your vocal on a separate track, the set the vocal copy ahead of the main track. Put your de-esser on the main vocal and key it to copy. Now, when an "s" comes through on the copy, it activates the de-esser on the main signal. By setting the copy for 50-100 ms earlier than the main, the de-esser will reach maximum reduction before the "s" appears on the main copy. This method won't leave any spikes on the leading edge of your words. Exactly what is sounds like, you use the de-esser to the extreme. This causes it to work on parts of the vocal that don't need to be fixed. 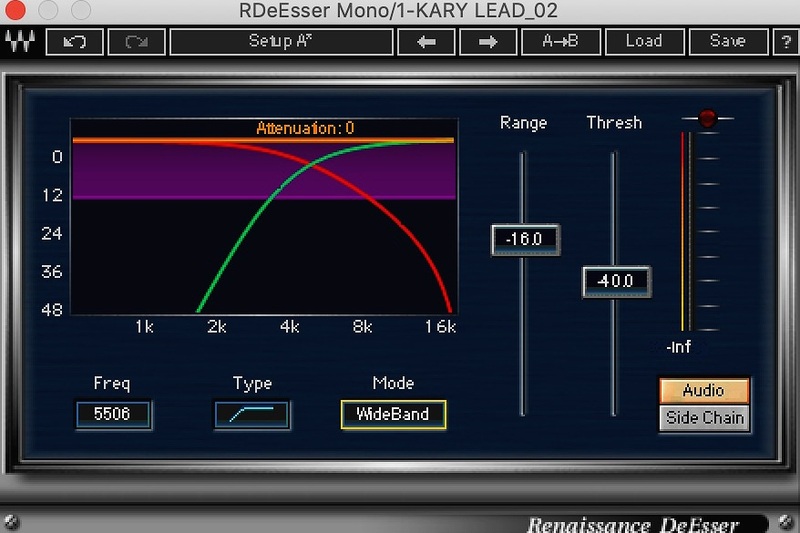 After using the de-esser, you can feed the track into an EQ, boosting the high-end. This technique works best with a really good de-esser and a really good treble boost, so your high end stays smooth. When recording, don't compress the signal in the channel path. This tends to exaggerate the sibilance. User your fader, instead, to level the vocals. Apply these same rules when mixing. Use your fader to keep a consistent vocal. Keep the music at a softer level when you mix. When focusing on sibilance issues, it's important that your music is not too loud. You are able to hear so much more detail in the music when it is at a softer level. Sibilance is a natural form of any speech, and present in any person's vocals, but it doesn't have to hinder your vocal recordings and performances. It doesn't have to be present in your music. There are several options available to remove the sibilance from your recordings, vocal options for the singer, and mixing options behind the scene. You can try these techniques yourself, or reach to a professional to help with your task. Professional mixing studios, like GSol Productions are masters at putting together the best de-essing, and other mixing technique to make your music sound like gold. They go above and beyond to put your tracks in the best possible light, and make your music shine. They have tips and tricks used daily to make you sound your best all the time.